The most exciting vegetable cooking in the nation is happening at Vedge, where in an elegant nineteenth-century townhouse in Philadelphia, chef-proprietors Rich Landau and Kate Jacoby serve exceptionally flavorful fare that is wowing vegans, vegetarians, and carnivores alike. Now, Landau and Jacoby share their passion for ingenious vegetable cooking. The more than 100 recipes here—such as Fingerling Potatoes with Creamy Worcestershire Sauce, Pho with Roasted Butternut Squash, Seared French Beans with Caper Bagna Cauda, and Eggplant Braciole—explode with flavor but are surprisingly straightforward to prepare. At dessert, fruit takes center stage in dishes like Blueberries with Pie Crust and Lemonade Ice Cream—but vegetables can still steal the show, like in the Beetroot Pots de Crème. With more than 100 photographs, behind-the-scenes anecdotes, and useful tips throughout, Vedge is an essential cookbook that will revolutionize the way you cook and taste vegetables. Rich Landau is a co-owner of Vedge, a modern vegetable restaurant that opened in 2011 to rave reviews from diners and critics alike. Landau has been at the forefront of vegetarian dining since 1994, when he opened his first restaurant. In 2009, he served the first-ever vegan dinner at the James Beard House. He lives in his native Philadelphia. 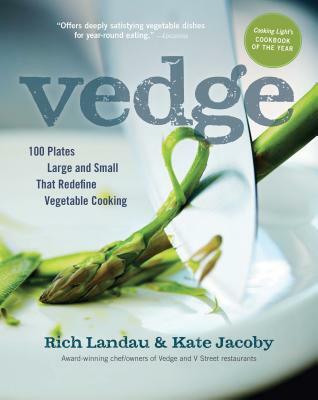 Kate Jacoby is a co-owner of Vedge, with her husband Rich Landau. Jacoby is Vedge’s pastry chef and manages its cocktail and wine program. She lives in her native Philadelphia. “VegNews’ 2012 Restaurant of the Year (and the only veg restaurant to make it on GQ's '12 Best Restaurants of 2013' list), coveted recipes from Philadelphia's dining darling is coming to a bookstore near you this July. Let husband-and-wife team Rich Landau and Kate Jacoby (owners and chefs of the famed eatery) transform your dinner parties this summer with dishes like Charred Shishito Peppers, Porcini and Celery Root Shepherd's Pie, and Chocolate Stuffed Beignets."